Organization, you are a cruel temptress. It still looks messy to me, but I think this is much better than where I was at this weekend. 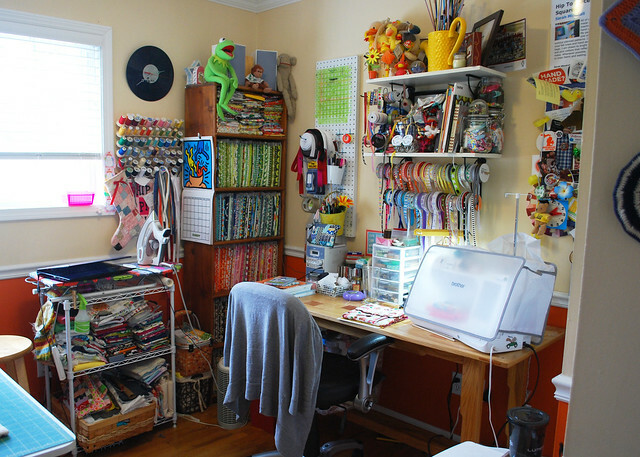 There’s still too much stuff stuck in one small room, but I have to admit, as much as I think I’d like a light, airy space, I love having everything at my fingertips, shouting colors and patterns at me while I work. It keeps me on my toes. If you came over to visit, I wouldn’t open the closet for you. Just saying. 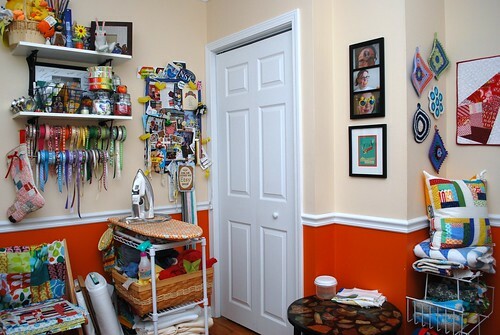 But everything else isn’t too bad–the fabric is put away, notions are in their spots and the floor is even pretty clean. I was even able to keep my Nana’s rock table set up (and mostly clutter free) and I’m very happy about that. Now…can I keep it this way for longer than a week? 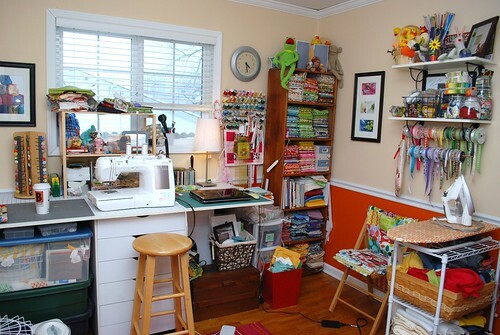 I’m trying to take a sewing break for the weekend so that I can get a few things accomplished in my sewing room. 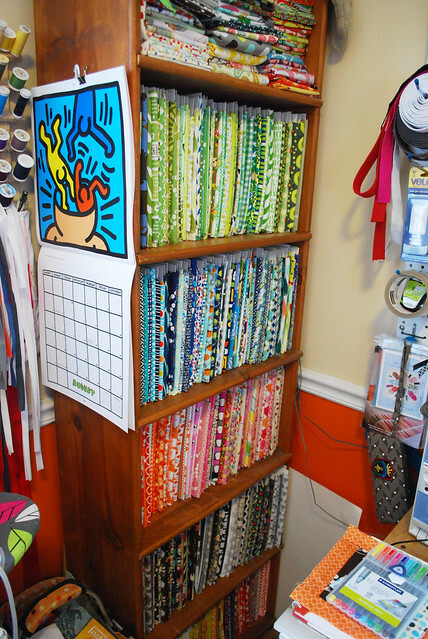 For the past few months I’ve been so busy working to get things ready for shows and Christmas that I’ve neglected keeping up my sewing room. It’s time now to get things back in order. Oh my. I’m so frustrated with the set up in here right now. 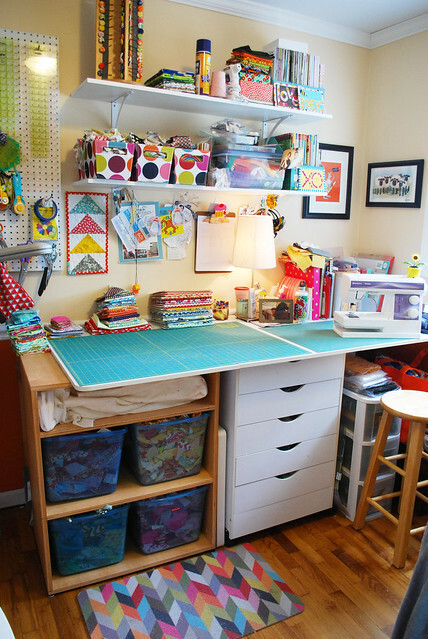 I moved my cutting table to where is presently is this fall so that I could open it up the full length, but I’ve never been happy with where I have it. Last year I inherited the small table in the bottom left of the above picture from my Nana. It’s made from a collection of pretty rocks and was made by another member of my dad’s family. It’s one of those things that I admired in my Nana’s house as a child, and was promised that I could have later on in life. As much as I love having it, there’s just no place for it in my house. 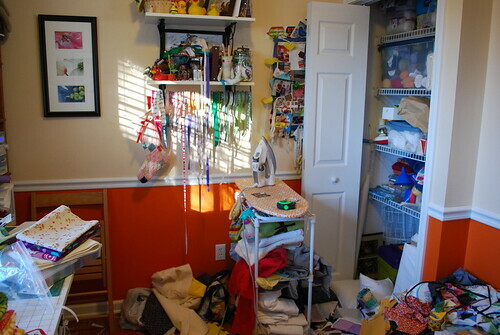 I felt I needed to put it out somewhere, but other than my sewing room, it just doesn’t fit. When I put it here in the room, I had to reorganize the way I had things set up, and I just haven’t been happy with it ever since. My goal for the rest of the weekend (and before I start on anything else, including binding the machine quilted quilt) is to finish and fix this mess of a problem. 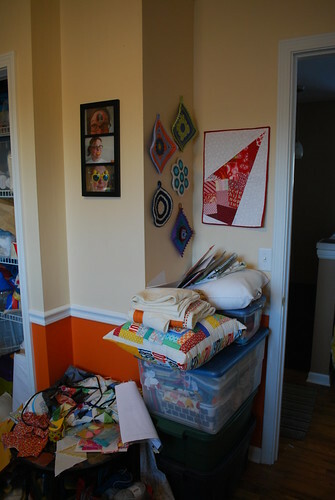 I love having a sewing room, but this isn’t helping me be creative at all. It’s just a headache. Look at all the goodness our new kitchen has produced! I made these yesterday for my sewing group and I don’t think anything I’ve ever baked has turned out this good. (I’m a terrible cook!) Mmmm. We’re just about finished with the renovation. There’s still trim to be put up, I have to make a curtain for the slider door, and in place of our old pantry we still have to install two cabinets and a countertop for a mail cubby that we’re planning on putting in. But overall, we’re so excited to have a working kitchen again that’s not only functioning again, but also pleasing to be in. I’m happy to say, I have finally created a softie to submit to A Month of Softies. I’ve been wanting to do this for months, and I just haven’t had a chance to try it out yet. I’m really pleased with my first attempt. I’m just not sure how I’m going to work this though. I want this project to be as much about making the right fabric choices as the quality of my quilting. I think my fabric is really going to be lacking in the lighter hues, especially in the reds and oranges. Does anyone have any good tips for me, or would be willing to do some fabric swaping for some of those lighter colors? Let me know. And since my kitchen is still taking up the majority of my life lately, (it’s so cool to see everything starting to look like a real kitchen!) here’s another look at the same wall that I showed in the last post. We have cabinets, a microwave, and a fridge that isn’t in the living room anymore! It’s so exciting! I’ve been meaning to update for days now, and I’m finally going to sit down and do it. We have been so busy this month, and I’ve had so little time to do anything quilt related. Ben and I have spent most evenings and late nights for the past several weeks hanging drywall, plastering, painting, scraping and laying tile in our kitchen. We gutted the whole thing, and turned an awful, ugly, once covered completly in nasty wood panneling into a halfway decent room! The cabinets just came in today, and tomorrow night we’ll hang all of the uppers. I’m so excited to have a kitchen again! Do you have any idea how much of a freak it makes you look like to have your fridge sit in the middle of your living room? It’s bad. And so after that’s all finished, I’m looking forward to finally going back to quilting full force. I haven’t worked on my wedding quilt in weeks; it’s been impossible to with all of our other work, plus with the heat here in Michigan this summer. And since I love starting new projects, I’ve signed myself up to participate in Dioramarama’s Modern Quilt-Along! I’m so excited! 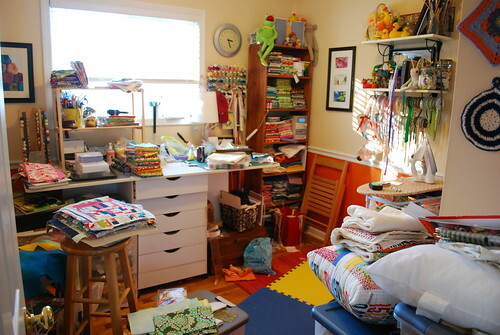 I wish I could spend the money splurge this month on The Modern Quilt Workshop, but with all of our kitchen expenses right now I think I’ll hold off. I’ll instead be working on the Eclipse quilt. I love piecing curves, but I usually piece by hand and I think I might go ahead and try this one on the machine. I’m looking at this project as a chance to improve my machine skills, as well as make a cool quilt. I’m still thinking about colors, but I’d like to try to do a mix of both solids and prints. I have a lot of fabrics that I’d love to use, and haven’t had a use for yet, so I may be able to find a home for it in this project. There’s still a lot to think about! 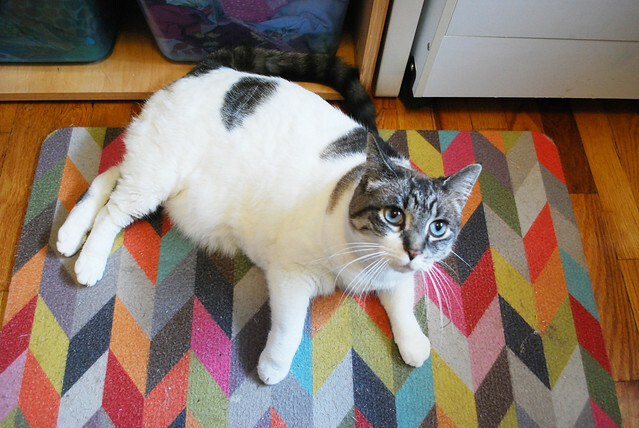 And before the month is up, I really want to find the time to participate in Loobylu’s A Month of Softies. This month’s theme is Sock Monkeys! How freaking cool is that! Now I just have to find time to make one…. I wasn’t sure I wanted to do it at first, but I think it’s going to look a lot better once the whole thing is done. Either way, it looks better to me than having nothing in that space. Without it, it just looked like I had forgotten to finish that section. Now I just have to worry about actually getting it done! Needless to say, I was pretty happy when I had a wall again.